38 Special is the second rock band in the Van Zant family, but any similarity between Donnie Van Zant's group and his older brother's Sturm und Drang aggregation, Lynyrd Skynyrd, is purely generic. 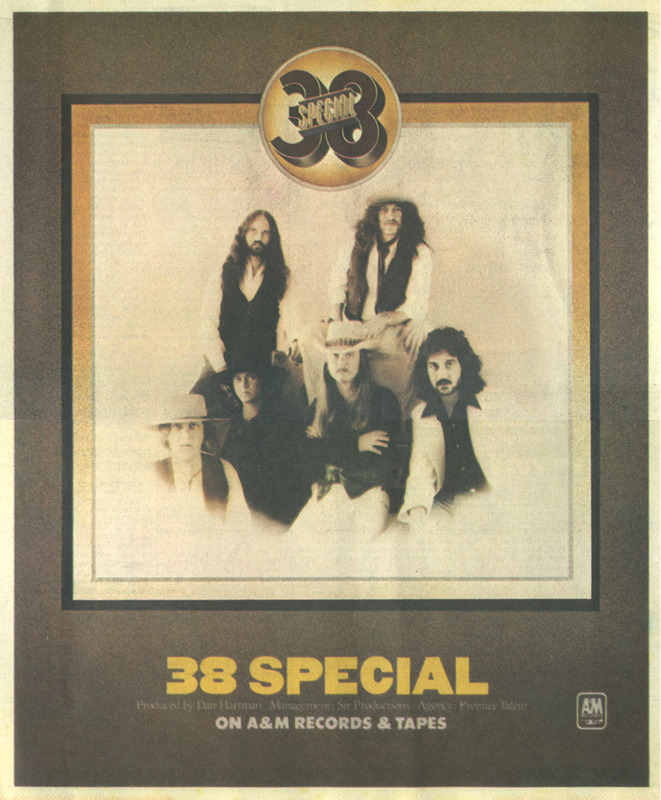 This band's adaptation of the Southern rock formula is more modest and workmanlike than Skynyrd's approach -- in fact, 38 Special is technically a better album than any of Skynyrd's studio recordings. The instrumentation is the standard combo of Stones chord patterns and Claptonesque leads, but the overall playing is much less frenetic than you might expect -- part of the arrangement in a very calculated sense. There is a similarity in the Van Zant brothers' lyrics. Donnie has been strongly influenced by Ronnie's romantic longing for the myth of the golden age of the South. The concern with transcendence ("Fly Away") and traditional values ("Play a Simple Song") is contrasted with the reality of a rocker's world "(Four Wheels," "Just Wanna Rock & Roll"). But where Ronnie's dilemma seems to cause him the pain that makes him one of rock's great angry young men, Donnie's persona is more innocent and hedonistic. He'll have to get past that if he wants to be more than a wan reflection of his brother. - John Swenson, Rolling Stone, 8/11/77. This sextet was produced in New York by Dan Hartman, bassist and songwriter with various Winter-Derringer groups. 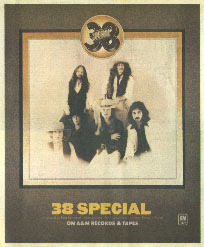 38 Special plays a brand of energetic, high-voltage rock you might expect from this pedigree. However, around the edges of the fast rockers and in the nicely harmonized easy ballads of the album there is a surprising and most welcome flair for laidback countryish elements to the riffing. Best cuts: "Around And Around," "Just Hang On."